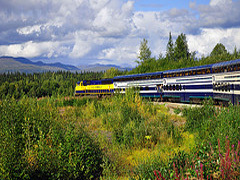 Take the Alaska Railroad from Anchorage to Denali Park National Park in our standard or deluxe dome car train. Enjoy the incredible vistas of the Alaska Range, complemented by narrated onboard history information, beverage and meal services. 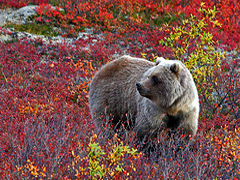 Enjoy the spectacular scenery, outstanding wildlife viewing opportunities for Grizzly Bears, Moose, Wolf, Dall Sheep and other mammals or additional activities such as rafting, flightseeing or sightseeing tours. Our Denali tour package includes transfers, a full day of wildlife viewing, your choice of hotel accommodation and individual program extension or combinations. Travel in style – travel by railroad! Included in our package: Your choice to travel onboard the standard Alaska Railroad train cars or the deluxe Panorama Dome Car with wrap-around glass Ultra Dome ceilings ensure unobstructed views of Alaska's spectacular scenery while you relax and enjoy the full beverage service and informative commentary provided by our on-board Hosts. Open-air viewing platforms allow you to step outdoors for the perfect snapshot or breath of fresh air. An elegant dining salon awaits with five-foot picture windows, crisp linen, fine china and a menu of delectable entrees prepared to your order by our on-board chefs. 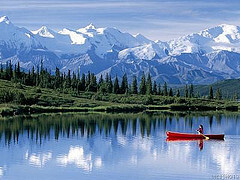 Note: Tour Package is also available from / to Fairbanks or Anchorage. Board the Alaska Railroad at the Anchorage train station. Options: Choose between the standard rail car or the glass-domed compartments with large panorama windows ensuring unobstructed views of snowcapped mountain ranges, pristine scenery and abundant wildlife. Get the camera ready as the train crosses Hurricane Gulch Bridge, 300 feet above the creek. 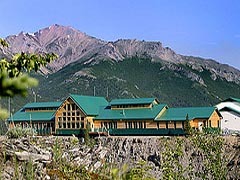 Arrival at Denali Village and transfer to your hotel. Included: Visit Jeff King’s Sled Dog Kennel - Join an intimate group for a personal tour with four-time Iditarod champion Jeff King at his Husky Homestead Kennel. Widely heralded as the most authentic and entertaining look into “bush Alaska” lifestyles, your visit includes holding Husky puppies, greeting more than sixty world-class sled dogs, and sharing twenty-five years of Alaskan tales of the trail. Enjoy the compelling stories and check out arctic survival gear, racing sleds and equipment used to traverse the 1100 mile long "Last Great Race on Earth"
Spend the morning at Denali National Park with a ranger sled dog demonstration, raft of float on the Nenana River or take a scenic flightseeing tour around the magnificent three - Mt. McKinley, Mt. Foraker and Mt. Hunter. Board the train and relax in your comfortable reclining seats. Enjoy a delicious lunch or listen to the narration from the onboard tour guide. You'll arrive in Anchorage early evening. A: Will I see Mt. Denali ?